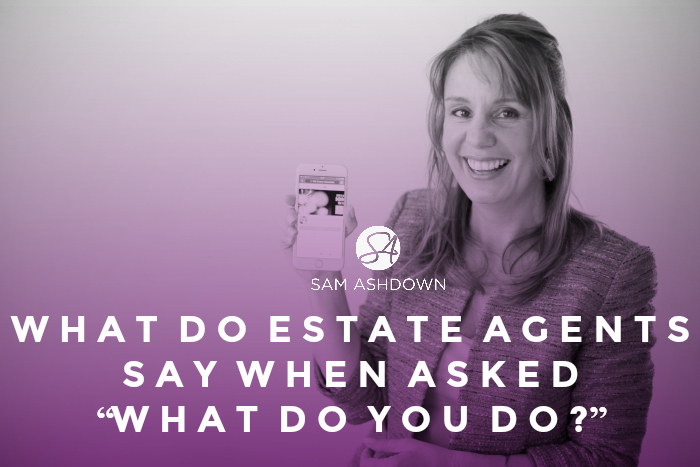 Do you reply, “I’m an estate agent”? Or perhaps you say, “I work for Downtons”? Or even, “I help people move ”? Do you feel a bit embarrassed when you tell a stranger what it is that you do for a living? Anxious they will take the opportunity to have a rant or a dig? And then there is the chance you’ll unleash a tale of woe from the teller. Just as midwives get regaled with birth stories whenever they declare their profession, (a midwife friend of mine tells people she is a bookkeeper), estate agents know are probably going to hear every sorry property sale story from the person they’ve told. Is it any wonder if you’re reluctant to admit your chosen career? I watched the first episode of BBC1’s Under Offer last Tuesday with interest, along with many others in my industry. It was kinder than I thought it would be; so far, at least. (Excepting perhaps the London not-in-the-real-world agent.) The editing wasn’t as audience-grabbingly cruel as it could have been, and certainly not of the same all-agents-are-liars ilk that we’ve seen in previous fly-on-the-wall documentaries of this type. Some estate agents I know were approached, but turned down an offer to appear on the programme, presumably because they were concerned – rightly so – that the editing would be sensational and one-sided. That said, the agents that were brave enough to say yes to the offer may well receive more positive coverage than they could have hoped for. Over the weekend, I was enjoying coffee with a friend in a local café. I told her I could spot an estate agent straight away, and mused that I thought I could even pick him out if he were in ‘plain clothes’, or walking and cycling garb, as many of the guys were in the café we were in. She thought this was very funny, and as I started to describe the clues that would give him away (yes, we were talking about male agents only), she noted how many were actually positive traits. For example, agents are often in a hurry, walk confidently with their head high, and are observant. They are usually very smartly dressed when in their work outfit, suited and booted, and when you talk to them, they normally make good eye contact. When they talk, they do so with passion, and often strong opinions, backed up by evidence and experience. It’s not so easy to spot a woman estate agent from afar, for me at any rate. But when you talk her, you’ll usually find she is very engaging and interested. She may be attentive and ask you all about where you live, looking for an opportunity, certainly, but also genuinely interested in your answers. Of course, not all estate agents are like I’ve described. There are many who do, in fact, let the side down; who are unscrupulous and devious, and who only have their own nefarious ends in mind in all their dealings. At least, that’s what I’ve heard. Because I’ve never met one. I often find myself defending agents; in conversations, on social media, to journalists. I tell them that estate agents are hard-working, likeable folk who are just trying to help people and make a living at the same time. Because it’s true. The agents I know are genuinely warm, kind people and I’m lucky enough to call many of you my friends. Isn’t it about time you started believing that of yourselves? People will think of you, what you think of you. If you bow your head and kick your shoes when you tell them what you do, you can’t blame them for assuming you’re ashamed of it. And witty rejoinders might be a protection mechanism, but perhaps you weren’t about to be attacked. Next time you are asked “What do you do?” please, hold your head high. With a sparkle in your eye and a big smile, say proudly “I’m an estate agent and I absolutely love it.” Because you do. How do you answer that question? Please, leave a comment, let’s find out what everyone thinks on this very emotive topic! I love being an estate agent, I like to think I help people fulfill their dreams. I never tell people what I do with embarrassment but I do know people who do! I have met agents who let the side down but in the main I think the majority love what they do and I would recommend the job to anyone who loves variety and people.